Some groundbreaking advances in vision research are offering new hope for the visually impaired, according to an upcoming talk to be given at the Senior Center by Dr. Russell Van Gelder. Van Gelder serves as Director of the University of Washington Eye Institute and Chair of the UW Opthalmology Department. In his talk, entitled The Promise of Vision Restoration, Dr. Van Gelder will describe how blinding eye diseases like macular degeneration, glaucoma and diabetic retinopathy are not an inevitable part of aging. Now that we understand that these causes of blindness are not age-related but actually diseases, the UW Eye institute, in collaboration with other universities, is exploring how technologies like stem cell therapy, gene therapy, and drug therapy might be used to restore vision. 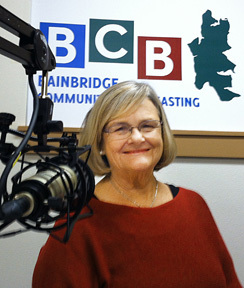 In this podcast BCB host Joanna Pyle talks with Catherine Hayner, a member of the Bainbridge Island Visually Impaired Persons (VIP) Support Group. Diagnosed 15 years ago with retinitis pigmentosa (RP), Hayner gradually became involved with the Library’s VIP support program and began exploring available resources for the group. After attending a talk given by Dr. Van Gelder at the library in 2012, Hayner became intrigued by the work of the Eye Institute, and now serves on the Outreach Committee of the Community Action Board of the Institute. Hayner believes that the work of the institute will help to ensure that the next generation will not suffer the blinding effects of retinal diseases. Credits: BCB host and studio tech: Joanna Pyle; BCB audio editor: Tim Bird.